This page describes how a round is scored. 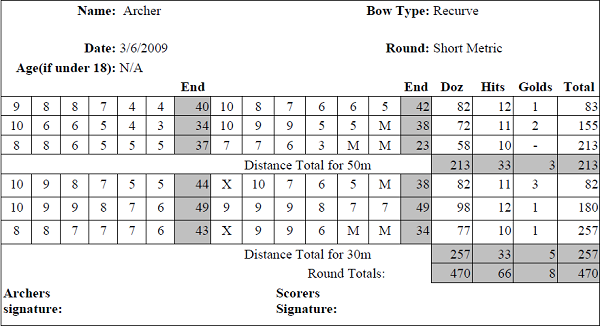 First it describes how points are scored for outdoor and indoor rounds, it then describes how a score sheet is completed. 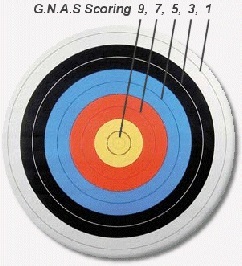 For all scoring schemes, if an arrow hit is touching the line between two scoring zones then the higher score is recorded. For Imperial (GNAS) rounds, five zone scoring is used, and is illustrated opposite. The gold scores 9, red 7, blue 5, black 3, and the white 1. For metric rounds, ten zone scoring and is illustrated opposite. The inner gold scores 10, outer gold 9, inner red 8, outer red 7, inner blue 6, outer blue 5, inner black 4, outer black 3, inner white 2 and the outer white 1. Within the 10 ring (inner gold) there is another ring which scores 10 but is recorded as an ‘X’. Scoring Indoors Scoring is similar to outdoor metric scoring, However ‘X’s are only recorded for FITA indoor rounds and not GNAS rounds. 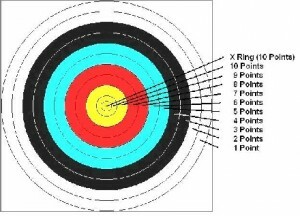 Also archers shooting a compound only score 10 if they hit the inner 10 ring, and the inner gold only scores 9 points. If the distance/face shot is not a formal round just record the distance and face size. The ‘End’ is the total of the arrows in a single end usually 3 or 6 arrows. The ‘Doz’ is the total for a dozen arrows. The ‘Hits’ are the number of scoring arrows in the dozen. The ‘Golds’ are the number of 10’s in the dozen. Note this does not include 9s. The ‘Total’ is the running total. The distance totals record the same information but for all arrows at each distance. The round total record the same information but for all arrows in the round. Once completed the scorer signs followed by the archer.